where would you place ascot system? I think we are more related to semantic web than search or both. As for the Mathematical Model, it's between the algebraic and probabilistic model. 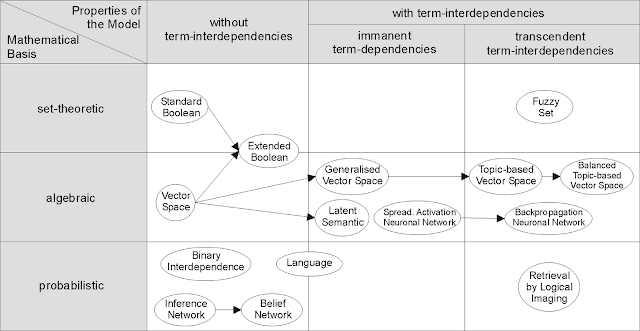 As for the properties, it' in the last column : transcendent term-independencies. algebraic because of the fact that we use a scalar to rank the documents? probabilistic because of the probability ranking principle: PRP --> yes sure. Instead of algebraic, I would say that it's informational since we use also tf-idf as a basis, which is a way to assess the relevance of a given document against a given term, from an information theory stand point; in fact, it's related to information entropy, right? So in short, it s an hybrid between probabilistic and informational, probabilistic-informational, I would say. As for transcendent term-independencies, what do you mean?